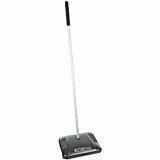 The HOKY 12.5" Wet/Dry sweeper with the patented Rotoblade wipers that pick up things that other sweepers cannot! Use it anywhere, anytime. If it works at the salad bar, just think what it will do anywhere else.